Charge: Violation of the Laws and Customs of War: 1. Did willfully and unlawfully commit cruel, brutal and inhuman acts, atrocities and other offenses against certain American, British and other Allied PW's. Verdict: Life Imprisonment/Only reduced to 30 years confinement at hard labor by recommendation of Lt. Col. Allan R. Browne, JAGD because he felt that the accused did wilfully withhold treatment and fail to discharge his duties as medical officer. Reviewing Authority's Recommendations: 1. In regards to accused Saito's "contributing to the death" of prisoner Kellogg, the evidence does not positively show that the actions or lack of actions by accused "caused, accellerated or contributed to Kellogg's death." 2. IN regards to the death of prisoners Slater, there is no allegation from Major Van Peenan that "the above mentioned acts contributed to, accellerated or caused the death of Major Slater. It appears that there was a difference in the diagnoses of the doctors." "It is not a war crime for a doctor to make an erroneous diagnosis, if it be honestly done." 3. Recommended that only 10 years of the sentence be approved: the remaining specifications "lack the viciousness and brutality usually found in the trials of war criminals." Prosecution Arguments: 1. Accused was the medical officer and medical supplies at the camp was under control of the accused. 2. Accused issued very little medicine, even at the request of the prisoner-medical officers. 3. Accused made patients wait for hours for medical attention. 4.Accused refused to see patients in many incidents, even when requested by the prisoner-medical officers. 5. Accused refused to send patients to hospital even when recommended by American physicians. 6. This refusal led to the death of at least 2 PWs. 7. Accused subjected prisoners to "improper punishments" and to beatings or severe punishments for no reason at all. Defense Arguments: 1. Never refused to treat a prisoner. 2. No request for medicine from the American doctors was denied: but they did not always get the supplied requested from the main hospital and the Red Cross Materials stored were for all the branch camps. 3. Accused treated prisoners according to what condition warranted: accused did not neglect or fail to treat prisoners. 4. Accused was an honest and conscientious doctor with a good reputation: patients were never made to work when ill, patients did not have to wait so long as to cause a prisoner to faint, and there was never a time when there were as many as 150 prisoners waiting to see the doctor. Hiroshima Branch camp had to smallest number of sick prisoners and the smallest number of deaths among the prisoners of the branch camps. 5. Accused never mistreated or beat prisoners: sometimes subordinates mistook his words and punished prisoners: he told them to give the prisoners time for "reflection." 6. Many prisoners preferred staying at camp rather than going to the hospital because they had their own doctors and no language difficulty. The camp was also equipped better than the army hospital. Judge Advocate's Recommendations: I think this case shows a sophistication in terms of the review process. The legal reasoning and the "looking" at the other trials as the markers for what sentences are adjudged to be fair can be seen here. 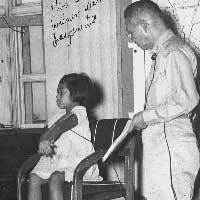 Child Testifying in Court in Manila.